This translates into roadmaps for the different web platforms and back office systems we have. It is brilliant to have largely removed the millstone of legacy systems from our TMDR business – and now to be able to move forward so much faster. As the article mentions, for me that is about improving the user experience in online recruitment – using technology to replicate the personal, face to face experience – not putting technology barriers in the way of people hiring people. This is a simple technique I came up with in my consulting days and it has stood me in good stead whenever I have been looking to take (technical, product and customer service) teams forward. Secondly, when the building block of Quality delivery is in place, the focus moves to Visibility. Visibility is pretty simple – it’s communication – ensuring everyone sees and hears about successes. Technical teams can sometimes not be the best communicators within a business (my own excluded of course), and often the simple fact of increasing visibility and increasing communications can result in a virtuous circle of confidence, trust and delivery. Thirdly, once we’re delivering Quality outcomes, and everyone has Visibility about those outcomes, we can move on to Innovation. When we have the Quality and Visibility credits in the bank, and the trust and goodwill of our customers and colleagues, it is so much easier to persuade everyone that (a) it is worth investing time/money in developing something new and (b) it is worth changing to something new. Quality and Visibility means the corporate antibodies don’t come to life, and Innovation has the opportunity to thrive and grow, or act as a learning experience. 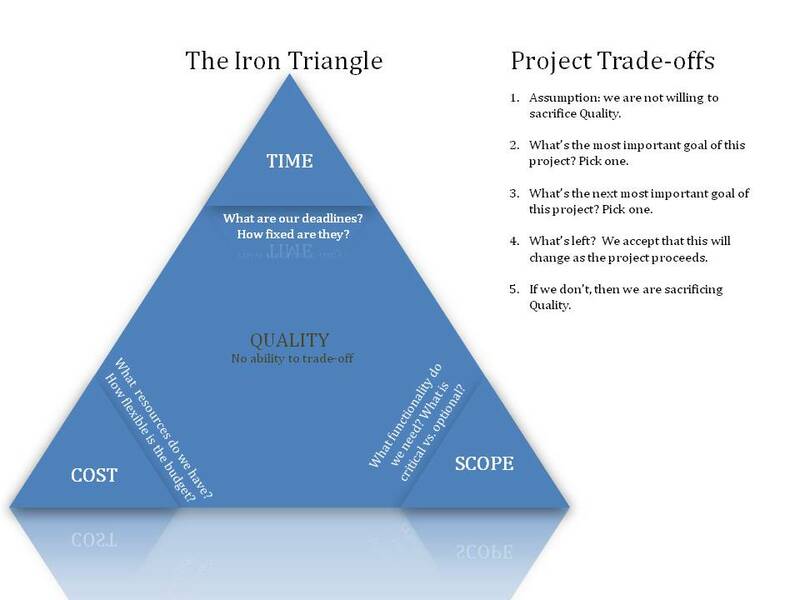 * Please note the Iron Triangle is no longer a PMI approved concept. Congratulations on your interview with CIO – it is a very important magazine in the management world!